Make Your Move a Fantastic Experience with Us! 1. Request a removals service online or over the phone. 2. Receive your no-obligation quote in a short while. 3. Meet the Fantastic pros on the day of your choice. 4. Relax in your new property after a job well done. To receive your free removals service quote, simply provide us with the details of your request: contact information, move-out and move-in locations, type and size of the property, as well as what floor, if applicable. We will then send you a price estimate, which you will need to confirm online or over the phone. Don’t forget that you can combine your moving service with our removals boxes delivery and professional packing assistance for a complete and hassle-free relocation. Just specify any additional needs you may have and we will tailor the removal service to suit your needs. Get your quote at any time. Get your quote at any time. We will get in touch with you prior to moving day to remind you of the service. Ensure that there’s a convenient parking space for the movers to position their vehicle. Upon meeting them, you can discuss any special requests you might have, such as what already packed belongings you wish to go first in the removals van or whether some boxes need to be handled with extra care. The removals pros will get on with the job expertly and load and secure your items carefully onto the moving truck. They’ve got all the necessary equipment and gear to carry out even emergency moving services while you sit back and watch. Whether you're within the UK or you are venturing out for good to an EU country, rest assured that your movable property is in safe hands. 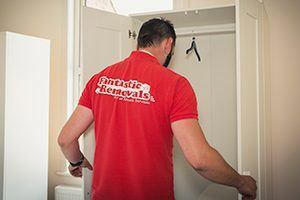 The removals service is fully insured if your items are packed by our professionals. As long as you leave the packing to us, your items will be comprehensively covered during the A to B transportation process. The teams are equipped with reliable GPS systems, allowing them to deliver your furniture, personal belongings or commercial equipment in the shortest time frame possible via a direct route to your new address. It’s that easy and simple! Just secure a convenient parking spot for the moving team at the delivery location. We will do our best to transport the load to your new address as quickly as possible, subject to traffic. Upon delivery, the unloading of your items will be done with the same care, diligence and attention to detail as the loading process was carried out. Your items will be safely taken off the truck and moved into the property in a secure and efficient manner. The removals guys will place each and every box in their designated room (according to your labelling system). Upon request, they will assemble any dismantled pieces of furniture for you at no extra cost. Fantastic Removals offers an extensive list of moving services to both domestic and business clients. Choose from our full house moving options, man and van solutions, international relocation assistance, storage services, and even box delivery or packing. We also have a flexible working schedule with a same-day removals service option. We here at Fantastic Removals always put our client's needs first on our priority list. That’s the main reason why we are a same-day moving company that offers fast and easy to book emergency removals services. But fast doesn’t mean unsafe with us - the moving teams are extensively trained and every single staff member has public liability insurance. We boast a modern, well-maintained and regularly serviced fleet of Transit and Luton removal vans to accommodate your items and transport them safely to your new location. Both vehicle options for our removals services are equipped with tail lifts for a safe and efficient loading process. In order to ensure a smoother moving process, we can do a video survey for your convenience. Instead of sending a surveyor for inspection to your place, we can see all we need on camera via live footage. Just use your smartphone or tablet. We now offer our clients the opportunity to join our Fantastic Club. As a club member, you will benefit from a 10% discount on more than 25 services in the removals, domestic, gardening, handyman, and other sectors, as well as from member-exclusive booking slots. With our GoFantastic app, you will also be able to enjoy your membership everywhere you go. Covered by a comprehensive insurance. Equipped with tools, removals supplies and different sized vehicles. *As part of the Fantastic Services Quality Standard, Fantastic Removals use only materials & vehicles provided by established and well-known local suppliers. Our removals company also specialises in international moves, which cover all EU countries. For more information, contact our 24/7 customer care team at your convenience. Packing and Moving Tips for a Smoother, Stress-free Move. Ready to Get Your Removals Service Now?